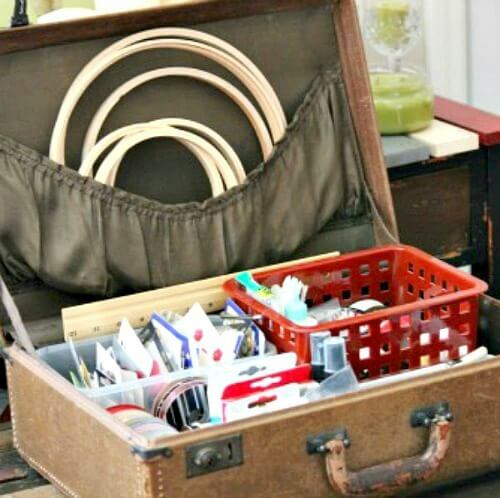 This old vintage suitcase makes a wonderful portable craft station. Close it up and you can store it in a narrow space most anywhere. Open it up and you have buttons, ribbons, and all manner of craft supplies. You could take it to your table or favorite chair and open it up and work on a craft project. In the back of the suitcase is room in the pocket for embroidery hoops, patterns, fabric, or whatever you need. You can tuck ribbon, ink pads, rubber stamps, adhesives, etc. 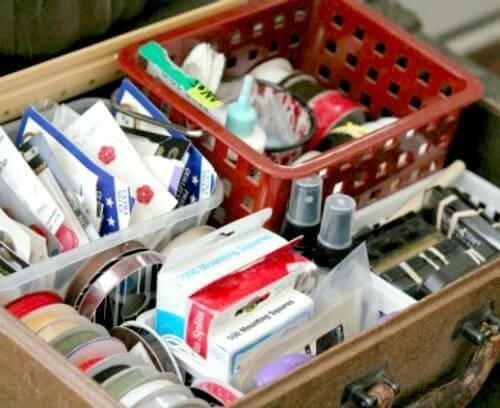 into place in this suitcase by organizing supplies in small storage boxes. Do you have a favorite way to store craft supplies? I found a New large square cosmetic bag that expands, has a zipper and lift out drawers at a thrift store. I couldn’t believe my luck. I have organized it with beads and cord for small macrame projects. Great for traveling. I love it. I also use vintage suitcases for craft storage. So handy and cute, too. That’s a great idea! I have lots of beads. I have to find that the challenge of finding more storage space is kind of fun actually. A computer armoire sounds perfect! They’re typically tall and therefore great vertical use of space. The vintage suitcase is a great idea! I store my supplies in a collection of vintage picnic baskets that I stack in a corner. I love things that are both decorative and provide useful storage. Oh my, I have two vintage picnic baskets, but I have linens in them. I’m going to remember your tip! I am not one to do crafts every day, but sometimes they’re the answer for a situation. It is great to take out a box–one for sewing notions, one for paper/painting, one for decorations (especially for Christmas), and have everything needed right there. And it keeps me from going crazy accumulating stuff I won’t get around to doing. I don’t even do them often anymore. I’ve purged and purged my supplies and completely done away with fabric. What a wonderful idea! The only crafts I work on (and not often enough) are scrapbooking, card making, art journaling, and Zentangle. I have all my supplies in stacking craft drawers in the spare bedroom. I am not familiar with Zentangle. Will have to Google it. So creative to use the vintage suitcase. Such a fun way to store craft supplies. I don’t want containers (suitcase) just setting around. I like to put them to use. Such a neat idea and I see vintage suitcases quite often when I am out shopping/browsing the local thrift stores and antique stores. This is the only vintage suitcase I currently have. And, those little pop-up boxes are gone ~ YAY!! Thank you!!! Yes, I took them off. Thanks for your input! I’m so lucky to have a 2nd bedroom which I use as a guest room/craft & art space. My wall of shelves helps me keep it organized. This year I plan to downsize many of my supplies since I no longer scrapbook. I no longer scrapbook either. But I have lots of paper supplies. Love the idea! I do have a designated room for my crafts/sewing stuff now that our three kids are older. I also need to go through my current space and evaluate what still interests me and what I’ll make time for. I did that just about a month ago myself. I acquire more will definitely keep this in mind. Thanks. I haven’t worked cross stitch in a long time. I used to enjoy it as well. a great small space remedy:! All my cross stitch supplies and current projects fit in a soft side tackle bag (21 x 12). It has a ton of pockets. I got as a present from Cabelas –it even came with plastic boxes and dividers, perfect for my threads. It is very portable and travels everywhere with me, as well as used at home. Love the use of vintage suitcase… decorative and purposeful… win win ! I adore your portable craft station – so wonderful! I kept my craft supplies in one room, I made the room looks like a home office with desk, computers, printers and other supplies. It’s perfect! What a great idea, Brenda! And they could be stacked up for a side table, too…useful storage!